INTERNATIONAL OPERATION DEPT AFRICA BENIN REPUBLIC. NOT YET RECEIVED THEIR PAYMENTS. I WISH TO INFORM YOU THAT YOUR PAYMENT IS BEING PROCESSED AND WILL BE RELEASED TO YOU AS SOON AS YOU RESPOND TO THIS LETTER. ALSO NOTE THAT FROM THE RECORD IN YOUR FILE YOUR OUTSTANDING PAYMENT IS US$800,000.00 (EIGHT HUNDRED THOUSAND UNITED STATES DOLLARS). 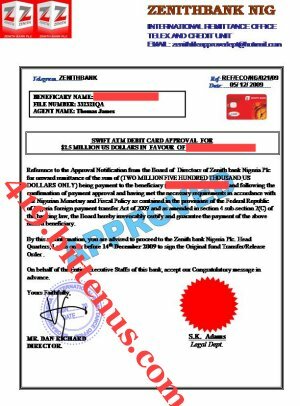 AS SOON AS THIS INFORMATION IS RECEIVED, YOUR PAYMENT WILL BE MADE TO YOU THROUGH ATM MASTER CARD OR BANK TO BANK CASH WIRE TRANSFER TO YOUR NOMINATED BANK ACCOUNT DIRECTLY FROM HERE BENIN REPUBLIC. YOU CAN EMAIL ME ON MY DIRECT MAIL ADDRESS AS SOON AS YOU RECEIVE THIS MEMO FOR FURTHER DISCUSSION. CONFIDENTIALITY NOTICE: This E-Mail is intended only for the use of the owner of this email address we send this message. We want you to contact the Zenith Bank Plc Benin republic because that is where your fund is awaiting for you,so contact them now and tell them how you want to receive your fund. The Bank told me that you will get what called International Transfer Permitte Tax before you can receive your fund and that is all you needed to do,even if you want to receive your fund on the daily bases through western union or bank to bank wire ttransfer you must get the International Transfer Permite first. Here are the contact information of the Bank. Let me know once you contact them and try to follow any advise they might give you because this is your fund and it still an Atm Card. The Bank also told us that if you will open account with them,they will convert the Atm Card into cash and wire the funds incash,so the choice is yours.